Apartment; kitchen, living room, 1 bedroom, 1 bathroom, sleeps 2. Beautiful and spacious, 1 bedroom apartment in this beautiful Oceanfront Villa. A perfect place to see the Aurora Borealis - Northern Lights (September through April) in a secluded countryside area without external lighting. A cozy house with character. It is located on a large private property with outstanding ocean and mountain view, and with a private beach. All inclusive. High Speed Internet. Hot tub / Jacuzzi. The house, and its beautiful surroundings have been used in film-making, and professional photography. The property has been awarded, by the municipality of Vogar, for cleanliness. 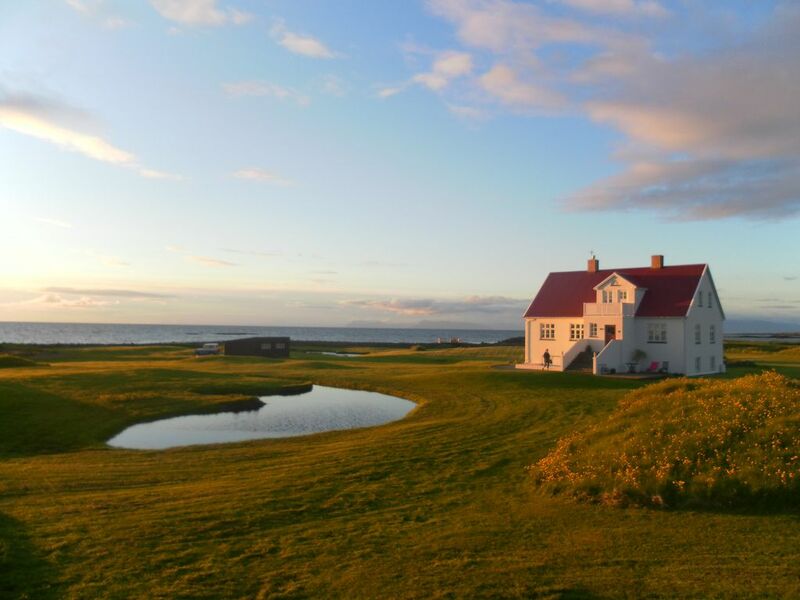 Located on the Reykjanes peninsula on the South West side of the island. The house is extremely well situated in a very quiet area by the water. Close to all major attractions such as the famous Blue Lagoon, (15 minutes away). The capital Reykjavik is 30 minutes away (downtown). Whale watching is 20 min. away. The Airport is 20 minutes away.This is a fabulous bird watching area. A truly magnificent place. Shared with the owner - fee applies. Available upon request for guests with special needs - detached. Just for DVD - large collection of DVD´s available, free of charge. Outdoor - private for guests. This apartment was everything we could have asked for, plus some! I don’t have the words to describe how much we loved this place. Vogar is a beautiful small town, close to Keflavík and Reykjavík. This apartment is right on the ocean. The host, Anna, was phenomenal. She gave us suggestions on restaurants, talked with us about the Icelandic culture, and was just all around a sweet person. She also told us we could hike/walk wherever we wanted in the surrounding area which was great. We chose this place mostly for the hot tub and the seclusion for viewing the Aurora Borealis. The hot tub faces North. So you can sit in the hot tub and look out over the ocean to watch the Northern lights. It was cloudy both nights we stayed so we didn’t getting to have that experience, but how amazing would that be. The apartment itself was gorgeous...very modern and well done. Make this a stop on your trip, you most certainly won’t regret it! We loved our stay in this great spot. Enjoyed sitting in the hot tub and watching the birds and clouds. The host was great and the apartment is stocked with a great assortment of basics. Yes we appreciated the location of this place...very practical for travelling the south western part of the country. The accommodation deserves a special notice for the high quality and cleanliness of the rooms and the perfectly arranged appliances. Very comfortable apartment with everything you could need for a relaxing and comfortable break. Anna and Birgir have thought of everything and they are a very welcoming and friendly couple. Very high specification to the interior facilities and we would definitely class it as luxury. You do not want for anything and I could not think of anything that could be improved upon. The attention to detail is impeccable. Slept very well on the comfy bed every night even through the heavy wind and rain we experienced. The location looks superb as well but unfortunately for us we could not take advantage due to bad weather. Thanks for an enjoyable few days. This charming apartment was perfect for our stay. Tasteful decor, very clean, wonderful whirlpool outside for viewing the Northern Lights and ocean. Good food nearby. Very close to the airport and Blue Lagoon. Easy access to primary highway. Reykjavik is close. The owner is very pleasant and accommodating. Many, many thanks. This was the perfect place to unwind at the end of our Iceland vacation. Anna and Birgir were extremely welcoming and accommodating. We are a family of four and were perfectly comfortable in this well equipped, tastefully appointed and spotlessly clean apartment. The views are amazing; don't miss sunset right outside the front door. We stayed for two nights at the end of our nine day vacation however I could have easily stayed for several more. It's a great location for exploring all of southern Iceland from Snaeffelsnes to Jokulsarlon; all sights and attractions can be reached in a day-trip (some days longer than others, of course). Reykjavik is a quick drive. Do not hesitate to book this apartment. Beautiful hiking trails in lava fields nearby.